Cornwall's Comedy Children's Magician and Family Entertainer. Children's Magic Shows Balloon Modelling Punch and Judy Close-up and Cabaret Magic for Weddings Birthday / Christmas Parties All corporate events. In recent years close up magicians have become popular at events where the organizers are looking to offer the guests something different. Ed Clarke is one of the most sought after magicians in the South west region - a skilled performer with an easy going attitude, specializing in this sophisticated and highly entertaining form of interactive magic. Moving from group to group, Ed demonstrates amazing card and coin effects, mind reading and sleight of hand. Members of the audience are able to enjoy fun, amazing effects... they will be amazed as items change, restore, multiply and levitate in their hands providing a magic experience they won't forget in a hurry! If you weren't witnessing it live you would swear you were seeing camera tricks. Children's Entertainer based in Porthleven, Cornwall. Performing at School Fetes and Festivals all over the Country. Paul was originally based in Berkshire. "magic with fun" is Gary's No1 motto. Psychic Entertainment, Seance Recreations, Psychological Illusions. "the personality magician the family enjoy"
Brilliant at Children's Party Magic / Family Shows - suitable for; Private or Corporate Events, Holiday Centres, Schools, Parks, Rallies, Christmas Parties, Clubs / Organisations. Close-Up Walkaround Magic - Suitable for; Private or corporate Functions / Promotions, MIX and MINGLE, MEET AND GREET, WEDDINGS, HOTELS, RESTAURANTS, PUB, CLUBS.. in fact almost anywhere! This can include, " Balloon Model giveaways". 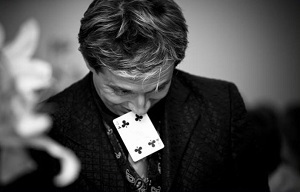 Street Magic, Busking Style - Suitable for; Private or Corporate Events, Street Parties, Rallies, Fetes etc. Twenty years experience working for you, helping make Your special occasion SPECIAL! Hey there, my name is Gary Smith and I am a professional close-up magician and balloon sculptor based in Cornwall, the home of myth and magic. If you enjoy seeing impossible things happen with everyday objects such as cards, coins, rings etc right in front of your face then book Smiffybug Magic for your next event. I perform close-up and sleight-of-hand illusions, so if you are looking for someone to get up on stage and start producing small rodents from headgear or performing amputations with garden tools best look elsewhere. Or maybe you would enjoy a more intimate mentalism and mind reading experience? And if you are looking for someone to distract the young ones at your child's next birthday party while you grab a cup of tea, then look no further. My act can be tuned to suit a younger audience and with a little balloon sculpting thrown in for good measure, you cannot go wrong. Martyn Smith is the leading professional magician in Cornwall, England. Known for his sure fire wit and breathtaking magic Martyn is the performer who leaves a lasting impression on everybody who sees him. Not your typical irritating magician who performs asinine tricks and undermines their audience - Martyn is the concerning gentlemen with a revolutionary innovative repertoire like no other entertainer you will ever see. 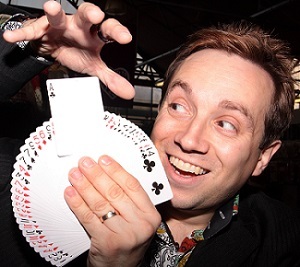 Martyn performs close up magic at parties, weddings, trade shows and other special events. Martyn is based in Cornwall and performs nationwide. No destination is too far. The only restriction is Martyn's busy schedule. Please get in contact as soon as you can to avoid disappointment. Martyn Smith amazes people all around Cornwall, including Penzance, Land's End, Helston, Falmouth, Redruth, St Just, St Ives, Newquay, Hayle, Camborne, St Austell, Truro, Saltash, Bude, Launceston, Bodmin, Lelant, Liskard. Martyn even performs in Devon too, in Plymouth, Exeter, Bradford, Brixton, Torquay, Tiverton and all around the country.